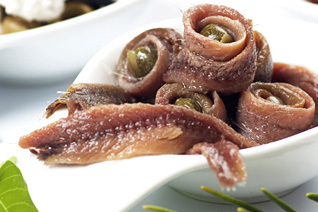 A relatively mild fish, light and plump anchovies take center stage in any kitchen. A relatively mild fish, light and plump anchovies take center stage in any kitchen. Whether packed in olive oil, brine or soy oil, our anchovies are filleted and salt-cured to enjoy plain, in a Caesar dressing and in a traditional Puttanesca sauce.